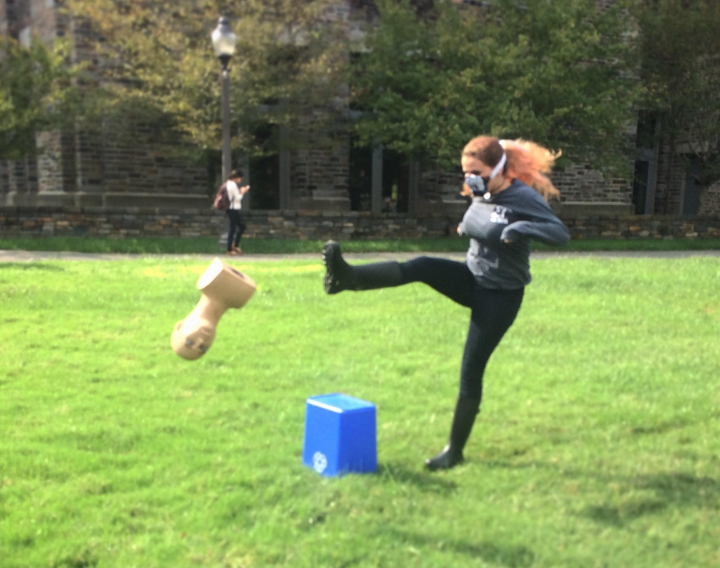 Freshman and sophomores at Duke University are getting a crash course in surviving the zombie apocalypse and learning a lot about environmental engineering along the way. 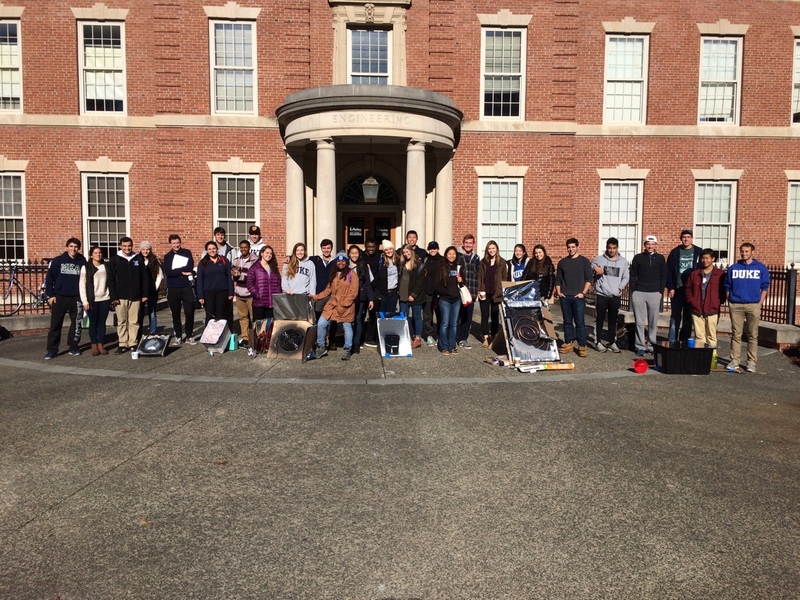 Zombie Apocalypse 101 is better known in the Duke coursebook as CEE 160L(24L): Introduction to Environmental Engineering and Science. In the first iteration of its new theme, the class tackles four of the basic needs everybody has to survive: air, water, food and energy. The first challenge facing the students this year was building an Improvised Breathing-Zone Particulate Barrier (IBPB) that can filter out any harmful airborne particles, including any potential “zombie-causing particles” that might be in the air. Each team’s mask was evaluated based on its design rationale, designated filtration process and filtering effectiveness. To make the challenge more interesting, the mask had to remain snug to the face and keep a firm seal while the wearer is working in the field, cooking on a stove or out on a zombie-slaying mission. “For the aerobic challenge, we were going to have the students just run in place, but then two graduate students we were working with, Karoline Johnson and Heidi Vreeland, suggested it would be more fun if the students in the class had to run up to a ‘zombie head’ and knock it off a platform,” said Schaad. 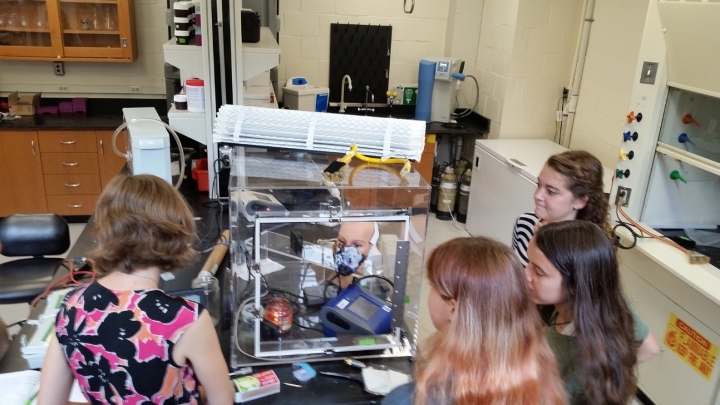 This year’s students still face obstacles of treating contaminated water, building a hydraulic elevator or water-pressure lift, and fabricating a solar thermal water heater. But according to Schaad, the class is still evolving, and will be renamed “Engineering the Planet” next semester while featuring different challenges. Besides building an air or water filter and a hydraulic elevator or water-pressure lift, students interested in the class next semester will also have to design and construct a structural support system and engineer a new “tenting” system for equitably allocating slots in the infamous Krzyzewskiville.